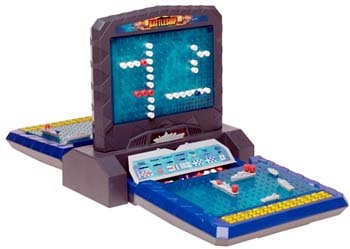 Electronic Battleship with advanced gameplay. It's the Classic Naval Combat Game ... updated with advanced gameplay and exciting strategic options. Experience the action-packed thrills and the explosive sounds of real-life warfare when you sign up for the Electronic Battleship Advanced Mission challenge! With instant programming you and your opponent are ready to play in seconds - or take on the computer in solo play. Use radar and sonar to locate your enemy's ships. Now use your special weapons to destroy them!